I have some questions about importing existing records: 1.) An existing dataset (excel file) contains information about plots(ID, coordinates...). How can I import this file and add additional columns (e.g. "Date")? 2.) A dataset (excel file) contains trees on different plots. Is it possible to import the list and add new trees on the same plots? The original tree ID and plot ID should be retained. New trees should automatically get an ID. 3.) Can already registered trees be identified with a plausibility check? Example: The current DHB must not be larger than the DHB measured 10 years ago. 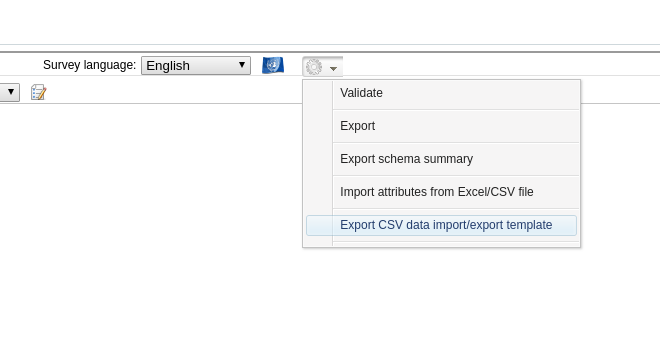 Have you tried to generate a "CSV data export/import template" from the Survey Designer? You can access this feature from the top right gear button. It will generate a zip file containing empty CSV files that you can use as a template for the data import. If you still have problems, we will contact you to your private email address. As I already said, in order to solve the second issue you need to have some kind of validation rule that accesses records outside of the record being edited, and it's not available at the moment. what do you mean exactly? Do you want to validate the trees against values contained in different records? Now you cannot perform such a validation in Collect, but we can think about it. Thanks for your support. I could insert data in a prepared schema, so point one and two is almost solved. But when I created an 1:N entity in the schema i got an error message, that I have to rename the columns in the excel file. An other error was, that the field names did not contain valid values. I tried to rename the column names but it still didn't work. To point 3: Trees that have already been recorded are visited again and measured. In order to identify them, a plausibility check should be carried out. If the BHD from 10 years ago has increased by more than 20 cm, it cannot be the right tree. Can this value be selected as a plausibility check?